In Mexico, la riata is a lasso. In America, it is a solid cheap daily cigar. I noosed this lariat at the B&M that keeps their walk-in wetter than an otter's pocket. Fact, I think I'll nickname the place Otter's Pocket. Cost less than two bucks even as a single. I stuck it on the bottom of the humidor along with the Perdomo Fresco, to dry out. Humi humidibbiditty went up from the usual stable 68% to 70% in two days. Brought it up to the top tray when I fired the Fresco, cause I thought the Fresco didn't have a chance to dry out properly underneath the other stuff. Riata was laying right beneath the hygrometer, and consequently brought the reading up to 74%. So I took it out and set it on the desk in an air conditioned room for a day. Still tight as a drum. Should have given it a week on the desk. If I buy again from Otter's Pocket, I'll set up a de-humi. Maybe an empty cigar box with a load of salt in the bottom. It appears there is a whole series of Riatas designated by number. This was an 800. I have no clue whether the 800 stands for size, batch, blend, or what. 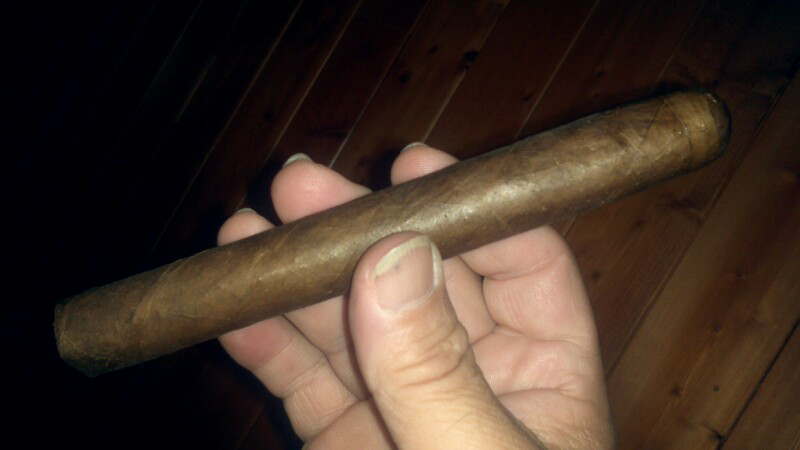 This one was a 6 1/2" x 50 maduro toro. It's a handsome dark dark brown. The wrapper and even the foot were all but odorless. Seemed firm and well built throughout. The unlit taste was like mud. If it hadn't been so wet, I might have said earth. Did not uncap worth a crap. Had to tug the cap off. Got shreds all over my shirt. And it continued to shed shreds throughout the experience. Unlit, it tasted like jerky.The draw was tight. Took two matches to light La Riata sucking strong. The flavor was earthy jerky, medium strength, consistent throughout, and it never bit once. Not much volume, but plenty flavor. I got the draw to ease some by rolling it in my fingers. Even damp as it was, it held a solid consistent even burn for an hour and a half, hitting it hard. Even at the nub, it never got hot or harsh. Afterwards, I got a pleasant jerky stinkfinger. This morning, a mild damp wheeze and a morning mouth that goes very well with coffee. I think la Riata deserves a second try dry. I shall return to Otter's Pocket, score another of these and a Fresco Maduro, and salt them away in a de-humi to give them a proper chance. I give this three stars.